Caltrain can and should become an eight-lane freeway. Not like an ugly concrete scar tearing loudly through the landscape, but in terms of throughput capacity in people per hour. Today, Caltrain already carries the equivalent of nearly 3 freeway lanes, and more than doubling the system's capacity is hardly a moonshot. For perspective, BART's Transbay Tube carries up to 27000 people per hour, almost double the entire capacity of the Bay Bridge with its ten freeway lanes. More than doubling Caltrain's capacity has been proposed before and is now being studied by the agency itself, after a decade of not thinking much past electrification. Capacity calculations can be controversial and rely on many details and assumptions, so the suggested path to expand Caltrain ridership from 3 to 8 lanes of freeway-equivalent is provided in the form of a spreadsheet, embedded below. You can dig into all the numbers and assumptions for each capacity increase and see the underlying formulas for yourself, down to the detailed number of seats in each train car, to understand how it all adds up. This is a living document, and feedback is appreciated! Recent documents seeking regulatory relief from certain FRA requirements for Caltrain's new EMU fleet reveal details of the interface between the train and a station platform. 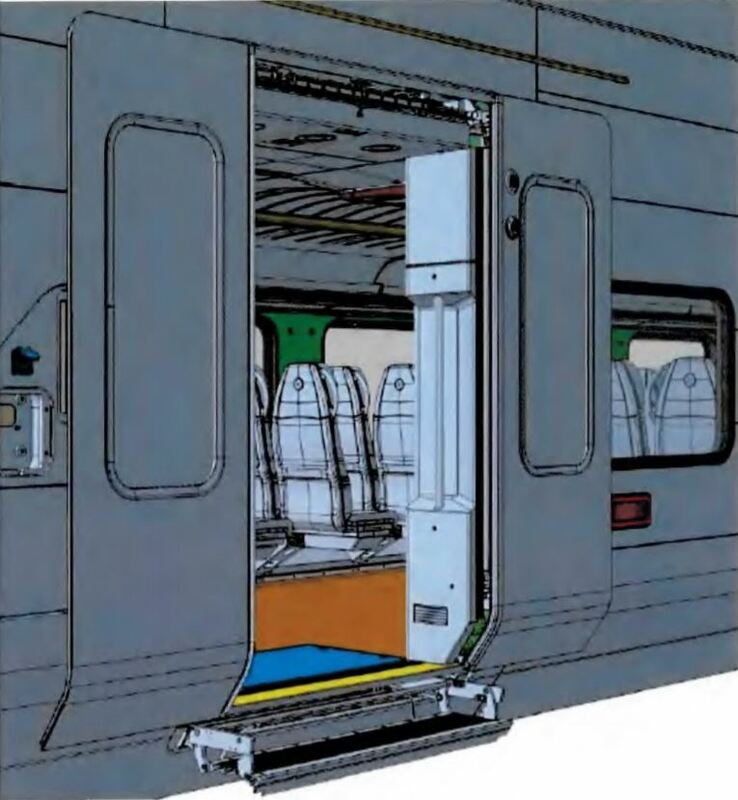 The lower doors of the EMUs will feature a deploying step at 15 inches (measured above the top of the rail), halfway between the 8-inch platform and the 22-inch train floor. The resulting step arrangement, when deployed, is similar to the existing Bombardier cars, although the floor height of the Bombardiers is 3 inches higher. 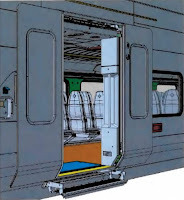 A closer examination of the step mechanism (see Stadler engineering drawing, as submitted to FRA) shows that the step module retracts upward from its 15 inch deployed height, using a cam mechanism, and stows with the step tread 2.5 inches below the door sill. This makes the step unusable for an ADA-compliant level boarding interface, where it might have been configured to close the gap with a 22" platform, at the same height as the train floor. Recall that ADA regulations for unassisted level boarding require a platform gap less than 3 inches, with vertical discontinuity less than 5/8". One faction of Caltrain staff evidently envisions level boarding using the low doors of the new EMUs, but the engineering drawing proves this is out of the question without a complete redesign and replacement of the door step mechanism. Even then, there are serious questions about the feasibility of a gradual transition to level boarding where the train fleet must serve a slowly evolving mix of 8-inch and raised level platforms. As per usual with level boarding, the end goal is clear, but getting there is the hard part and often involves lots of hand waving. Initially, Caltrain will utilize only the lower level doors to serve their existing 8-inch platforms. Once CHSRA service begins in the corridor, there will be a station or two that will have high level platforms and will be served by the Caltrain EMUs via the intermediate level doors. Other Caltrain stations will remain low level and will be served by the lower level doors. No! Continued use of 8-inch platforms means long dwell times and time-consuming conductor-assisted boarding for persons of reduced mobility using a manually emplaced bridge plate. This antiquated state of affairs cannot be allowed to persist. Blithely ignoring the minutes that can be saved while the train is at rest is unacceptable, especially after spending two billion dollars to save minutes while the train is in motion. It is time to adopt a policy on level boarding, and to push Caltrain's staff and consultants to reach agreement on the technical approach to get there. Here we are in 2018 and there is still obvious disagreement about whether to implement level boarding at all (a no-brainer if you look at the big picture) and at what height, using what doors on the new EMU fleet. Stop dithering and do it! Footnote: there are multiple waiver petitions relating to EMU design details.